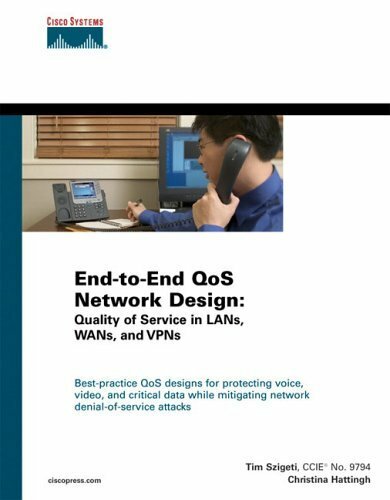 End-to-End QoS Network Design is a detailed handbook for planning and deploying QoS solutions to address current business needs. This book goes beyond discussing available QoS technologies and considers detailed design examples that illustrate where, when, and how to deploy various QoS features to provide validated and tested solutions for voice, video, and critical data over the LAN, WAN, and VPN. The book starts with a brief background of network infrastructure evolution and the subsequent need for QoS. It then goes on to cover the various QoS features and tools currently available and comments on their evolution and direction. The QoS requirements of voice, interactive and streaming video, and multiple classes of data applications are presented, along with an overview of the nature and effects of various types of DoS and worm attacks. QoS best-practice design principles are introduced to show how QoS mechanisms can be strategically deployed end-to-end to address application requirements while mitigating network attacks. The next section focuses on how these strategic design principles are applied to campus LAN QoS design. Considerations and detailed design recommendations specific to the access, distribution, and core layers of an enterprise campus network are presented. Private WAN QoS design is discussed in the following section, where WAN-specific considerations and detailed QoS designs are presented for leased-lines, Frame Relay, ATM, ATM-to-FR Service Interworking, and ISDN networks. Branch-specific designs include CiscoÂ® SAFE recommendations for using Network-Based Application Recognition (NBAR) for known-worm identification and policing. The final section covers Layer 3 VPN QoS design-for both MPLS and IPSec VPNs. As businesses are migrating to VPNs to meet their wide-area networking needs at lower costs, considerations specific to these topologies are required to be reflected in their customer-edge QoS designs. MPLS VPN QoS design is examined from both the enterprise and service provider’s perspectives. Additionally, IPSec VPN QoS designs cover site-to-site and teleworker contexts. Whether you are looking for an introduction to QoS principles and practices or a QoS planning and deployment guide, this book provides you with the expert advice you need to design and implement comprehensive QoS solutions.